Telemetry confirming that the engine burn went as planned reached the New Horizons mission operations center at the Johns Hopkins Applied Physics Laboratory (APL) in Laurel, Maryland, via NASA’s Deep Space Network stations in Goldstone, California and Canberra, Australia, shortly after 1:15 p.m. EST. The radio signals carrying the data traveled over 3.5 billion miles (5.6 billion kilometers) and took more than five hours to reach Earth at the speed of light. New Horizons Mission Design Lead Yanping Guo, of APL, said Wednesday’s burn adjusts for what the team has learned since 2015 from new Hubble Space Telescope measurements of MU69’s orbit, as well as the spacecraft’s own location. After the burn, the spacecraft transitioned out of a so-called “three-axis stabilized mode,” the operating mode that allowed New Horizons to make new telescopic observations of six KBOs over the past week. These science observations will reveal new information on the shapes, surface properties and satellite systems of these objects, in ways that can’t be done from Earth. Images from these studies will be transmitted to Earth in the coming weeks. What’s Next for New Horizons? 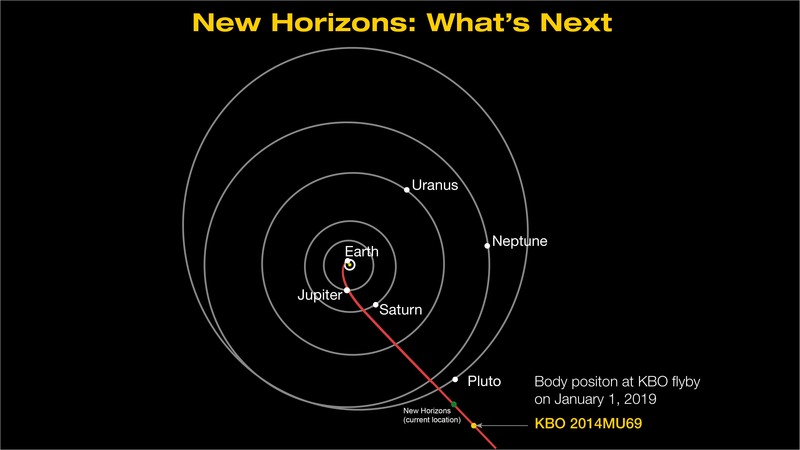 The red line marks the path of the New Horizons toward its next flyby, a Kuiper Belt object known as 2014 MU69. The green dot approximates the spacecraft’s current position.